This stamp issue pays tribute to the country's men and women of letters. Writers who have all made a remarkable contribution to our life, history and literature. 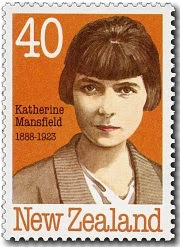 Born on 14 October 1888, Katherine Mansfield grew up with happy childhood memories of Days Bay, Wellington. After studying music in London, she decided "I must be an authoress" and began writing. In 1918, she married George Murray and that same year was diagnosed as having tuberculosis. Her last five years were spent searching for a cure and, perhaps as a reaction to her illness, producing her most creative and fruitful writing. 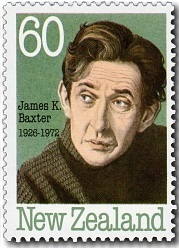 60c - James K Baxter. James K Baxter's father was a leading conscientious objector in World War I and James took his father's lead and always stood up for his beliefs. His heroes and heroines were on society's fringes - drunks, prostitutes and good-hearted derelicts. He became known as 'Hemi', the bearded, barefooted wise man who lived in poverty in a Maori settlement called Jerusalem in Wanganui. When he died in 1972 eight hundred people flocked to Jerusalem to mourn him. 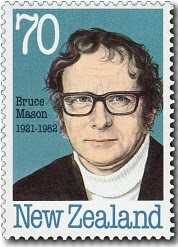 Bruce Mason was known for always expressing New Zealand's distinctive identity in his works. In 1959, he first performed the dramatic solo performance for which he is so well loved - "The End of the Golden Weather", with its theme of childhood's end. He managed nearly 1000 performances before he died of cancer in 1982 - not before he was awarded a CBE and an honorary doctorate. 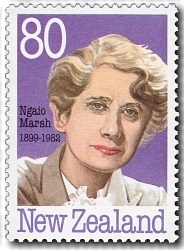 Ngaio Marsh first worked for two years in theatre in New Zealand and London - cementing a life-long love for Shakespeare's plays. At the age of 34, she had her first novel published and went on to write 30 detective novels up until the year of her death. Dame Nagio Marsh was awarded an OBE in 1948 and an honorary doctorate 15 years later. She died in 1982 at the age of 83 - with her next novel on the drawing board. First Day Cover - 1 March 1989.